Only showing entries about mountains from Sustainable Travel. 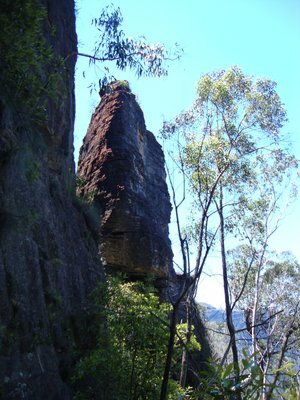 View entries about mountains from all Travellerspoint blogs. With being from a flat, boring, grey country like Belgium and all, I'm sure you'll understand when I say that I feel like I've been living in a zoo for the last week. 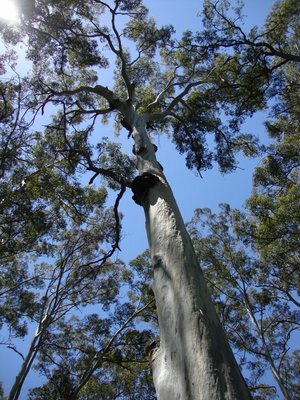 Up here in the Blue Mountains instead of your everyday Pigeons you have Kookaburras who's call sounds like drunken monkeys laughing at an extraordinary volume. I saw one diving down right in front of me the other day catching something in his large beak thrashing his head repeatedly from left to right. It took me the full minute gawking at the action going on about 2 meters away from me to realize that he was trying to kill a 30 cm long yellowish snake. I had to step back and had to stop myself from letting the word murderer escape from my lips. He was actually doing me a favor. I certainly didn't want to step on a snake in my backyard. So I let him swallow it in peace. There's plenty more of these weird sounding colorful birds that you can spot everyday just flying about. It seems so unreal to me. Almost as if they all just escaped from their cages. There are crimson Rozella's and plenty more other kinds of Rozella's, they look like big colorful parrots. Then there are Lorrikeets. Also similar to a small parrot. My first rainbow Lorrikeet I spotted in Sydney Harbor (our first Aussie HelpX). I was in awe of seeing this beautifully rainbow colored thing flying around in our garden. I'd never seen such a thing in the wild.. Certainly didn't expect to see it in a big city like Sydney. Just the other day we saw Kangaroos jumping around on the road. They have signs here. Watch out for Kangaroos crossing. You get it.. like deer? So I'm new to this part of the world. My understanding after 3 weeks of being here of how this country is divided up, goes a little something like this. Australia is a big island right? Well you can divide it up in 3 parts. The first is the coastline, that consist of big cities and suburbs. Next is the bush. 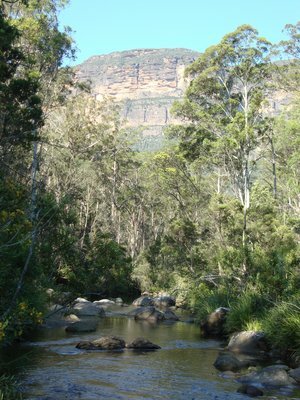 Now the bush is a second wide circle, filled with National parks, beautiful woods and wildlife with smaller cities and villages, very much all spread out. Then last but not least there is the outback. What they call No mans land. It's all desert and wilderness containing heaps (Australians use the word heaps a lot to describe a unknown large quantity) of deadly creatures. Well that's my description of it. So now we're in Blackheath. 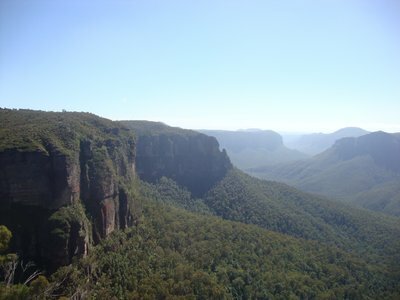 A small town in the Blue Mountains. 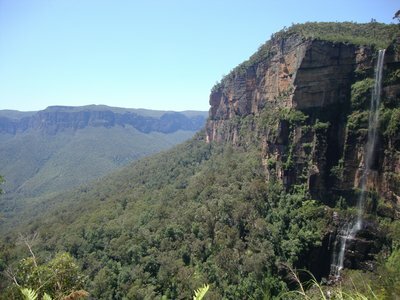 Beautiful place and definitely a lot cheaper then Sydney. Our host is building a cob house close to town and we're helping her out. We got some previous experience and were welcomed with open arms. In other words, she takes good care of us. This time around we're using some different building techniques. The outside walls of the house for example are much thinner then the cob walls we've helped made before. Our job right now is mixing a clay mixture with straw to fill up the walls with. This is called the light clay/straw method. It is an infill system. The insulation aspect of it works perfectly fine for you doubters out there. These methods have been around for a looooo-oong time. So if you think modern building techniques will do a better job, you're wrong. A lot of the modern building materials used are industrial and filled with chemicals you are living and breathing every day. I wouldn't want my kids to grow up in a death trap, do you? These days green building techniques are being combined with conventional ones and people are starting to see the benefits. We're not completely there though, but it's a start. If you're interested there is an abundance of websites and books out there for you to read up on. 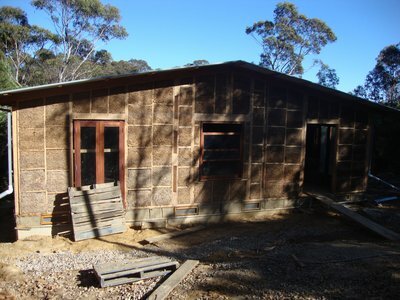 I'll give you a popular one for amateur builders right now, www.greenhomebuilding.com. Just so you can browse and get an idea. 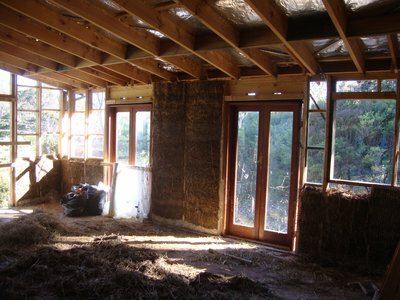 Light clay/straw keeps your house cool in summer and hot in winter. It is incredibly stable in temperature and changing slowly as temperatures change to extremes outside. So basically we are playing with mud all day and guess what? It's extremely fun! More updates on the cobbing soon.